When Duff Goldman and Buddy Valastro are in the kitchen, it's pretty tough to say who's really the batter baker. 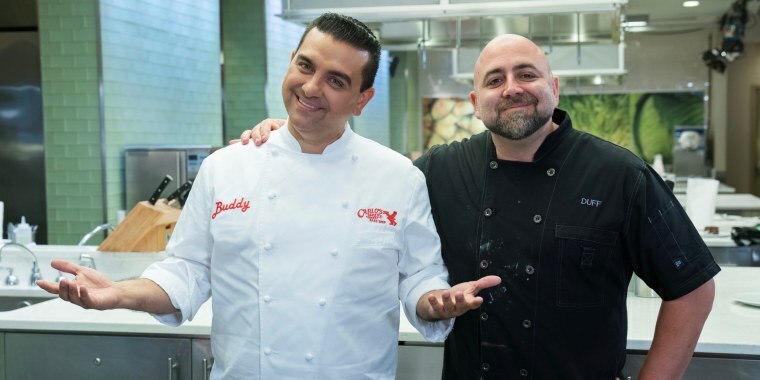 In an effort to determine the true king of cakes once and for all, the two celebrity pastry chefs will go nose to nose in Food Network's new series, "Buddy vs. Duff." The network announced Thursday that the "baking brawl" between two bros will premiere March 10. Goldman, the Charm City Cakes bakery owner who rose to fame on "Ace of Cakes," will face Valastro, a proud Italian-American "Cake Boss," in a series of baking challenges. Both bakers will put their senses and skills to the test in the competition (which runs for six weeks) where taste, technique and and talent will determine the true winner. Each episode will consist of two rounds — a "bake-off" to show how well they bake and a "cake-off" to spotlight the over-the-top creations for which they've both become famous. Pastry chef Sherry Yard, who served on the panel for "The Great American Baking Show" alongside Spice Girl Emma Bunton, and "Food Network Challenge" chef Keegan Gerhard will judge Goldman and Valastro, alongside guest experts like comedy duo Penn and Teller, Gesine Bullock Prado, Christina Anstead and Kevin Delaney. "Audiences have come to recognize Buddy and Duff as the biggest names in cake, known for creating larger-than-life, jaw-dropping delectable designs as well as massive baking empires," said Food Network president Courtney White. "Never before have these two baking icons gone head-to-head in a competition, until now." In the series' finale on April 14, the two chefs will face the final challenge of creating chocolate desserts that can hide engagement rings for surprise proposals. Goldman may actually have the advantage there since his own impromptu proposal to Joanna Colbry was so adorable. But then again, Valastro has 18 years of marriage under his apron. Oh, and he's also created a life-sized replica cake of Betty White. That definitely counts for something.